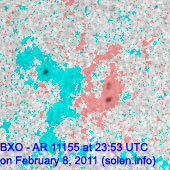 Last major update issued on February 9, 2011 at 04:20 UTC. 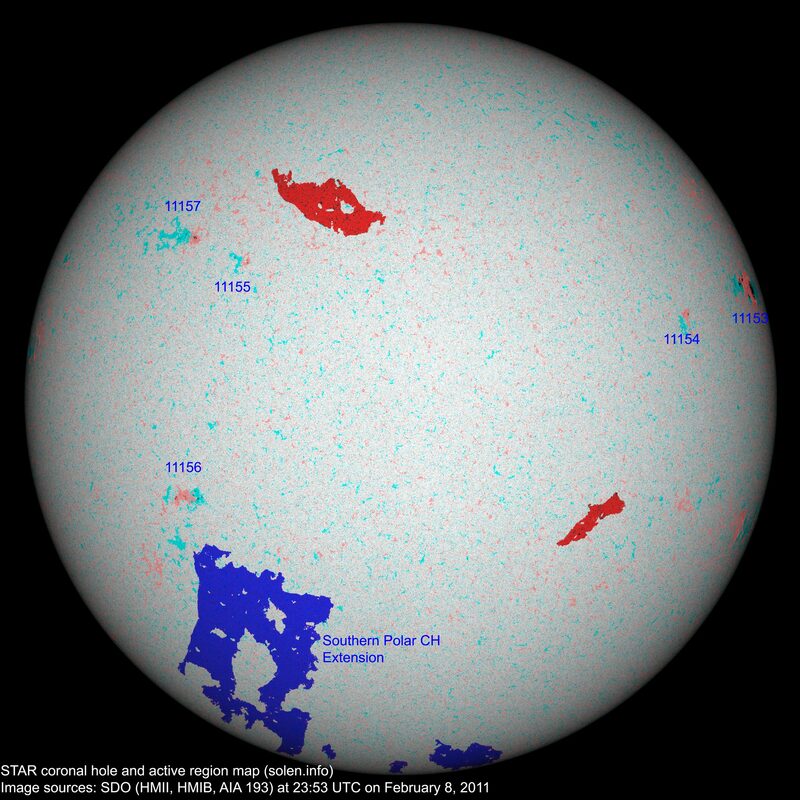 The geomagnetic field was quiet to unsettled on February 8. Solar wind speed ranged between 362 and 441 km/s. 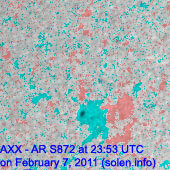 Solar flux measured at 20h UTC on 2.8 GHz was 89.7 (increasing 9.7 over the last solar rotation). The planetary A index was 4 (STAR Ap - based on the mean of three hour interval ap indices: 4.1). Three hour interval K indices: 23010011 (planetary), 23121011 (Boulder). 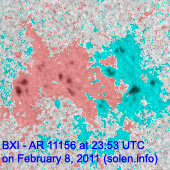 Region 11153 developed very quickly with the main penumbra growing from small to large in just one day. Polarities are intermixed and further M class flares are possible over the next couple of days until the region is behind the northwest limb. There's a possibility of a proton event as well. Flares: C1.0 at 18:54 and C4.0 at 21:12 UTC. 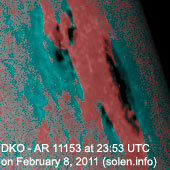 At 01:31 UTC on February 9 the region produced an impulsive M1.6 flare. 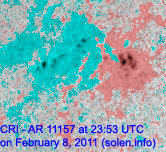 New region 11154 emerged in the northwest quadrant early in day. 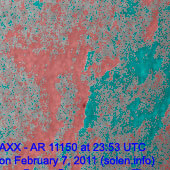 New region 11155 emerged in the northeast quadrant on February 7 and was numbered the follwing day by NOAA/SWPC. 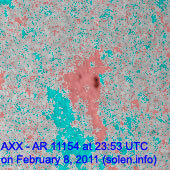 New region 11156 emerged in the southeast quadrant early in the day. The region has many small spots. New region 11157 emerged in the northeast quadrant early in the day. 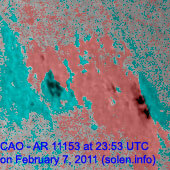 February 6-8: No obviously Earth directed CMEs were observed in LASCO or STEREO images. 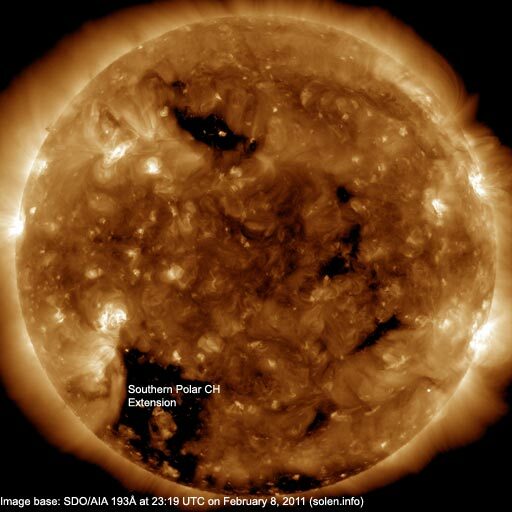 The geomagnetic field is expected to be quiet on February 9-11 with a chance of occasional unsettled intervals due to weak coronal hole effects.